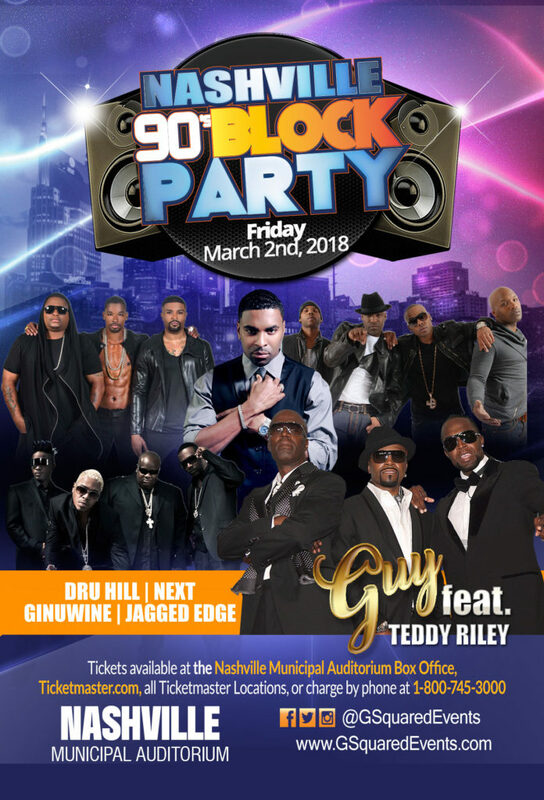 The 90's Block Party 2018 Tour with Special Guests GUY, Monica, Ginuwine, 112, & Next | Kicks Off Feb. 14th - TheUrbanMusicScene.com | Concerts & Festivals! HOUSTON (December 11, 2017) –The “90’s Block Party” has announced a new North American tour stop in New York City, NY, produced by G-Squared Events. The 90’s Block Party Tour will span across 40 cities between February and April 2018. The 90’s Block Party Tour invites attendees to reminisce about the most incredible R&B music from that decade. A time when music was fun, and everyone was able to party and have a good time. The New York City 90’s Block Party Tour stop will feature performances by Guy, a legendary 90’s R&B Band, whose members include Teddy Riley and brothers Aaron and Damion Hall. Adding to the excitement, Guy will be joined by tour special guests Monica, Ginuwine, 112, and Next. Talent may vary by market. The 90’s Block Party 2018 Tour kicks off on February 14 th at the Bellco Theatre in Denver, Colorado, hits major markets across North America, and concludes in Houston, TX, at the Smart Financial Centre. Check your local listings or go to http://gsquaredevents.com for more information. entertainment. G-Squared Events is best known for bringing high-quality production events with some of the nation’s biggest entertainers including Charlie Wilson, Tyrese, Steve Harvey, Keith Sweat, Brian McKnight. For additional information, visit http://www.gsquaredevents.com . One Response to "The 90’s Block Party 2018 Tour with Special Guests GUY, Monica, Ginuwine, 112, & Next | Kicks Off Feb. 14th"